Competition at Confessions of a Bookaholic – It's Time to Read! 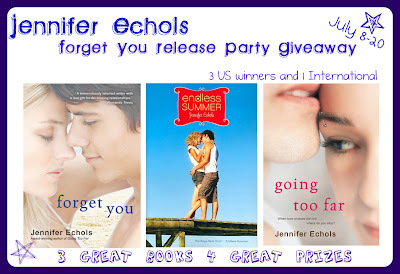 Jennifer Echols is giving away a signed copy of FORGET YOU , ENDLESS SUMMER , and GOING TOO FAR ! 3 winners- 1 book each! These are for US only so I am having my own additional giveaway for International followers. I <3 you guys too! I will be giving 1 International winner a choice of the 3 books listed above and I will order it from The Book Depository and have it shipped to them. See the LIST of countries they ship to. INTERNATIONAL winner- gets choice of the 3 books. How to Enter: To enter you MUST fill out the form linked below. Email addresses will be used to contact the winners. If you wish to enter both giveaways, please fill out both forms. = a possible 15 entries! If you do a blog post feel free to use the contest image above. You can retweet this message for the International giveaway! RT @TotalBookaholic Win choice of book by Jennifer Echols! Includes FORGET YOU! INTERNATIONAL! http://bit.ly/dcz7HQ Ends 7/20! Plz. RT! Entries must be received by 11:59 a.m. (Central standard time) on Tuesday, July 20th. If you’re under 18, you must have a parent’s permission to enter, because Jennifer will need a shipping address to mail the prizes to you if you win. Same goes for the International giveaway I’m doing. To be counted for the International giveaway, you must fill out the separate form! You CAN sign up for both but please tweet each contest individually. Thank you! Winners will be announced July 20th and I will email all of them. The winners will then have 48 hours to send me their address.